The games are really getting better and innovative. And sometimes, an addicting kind of retro-like game pops up out of nowhere. 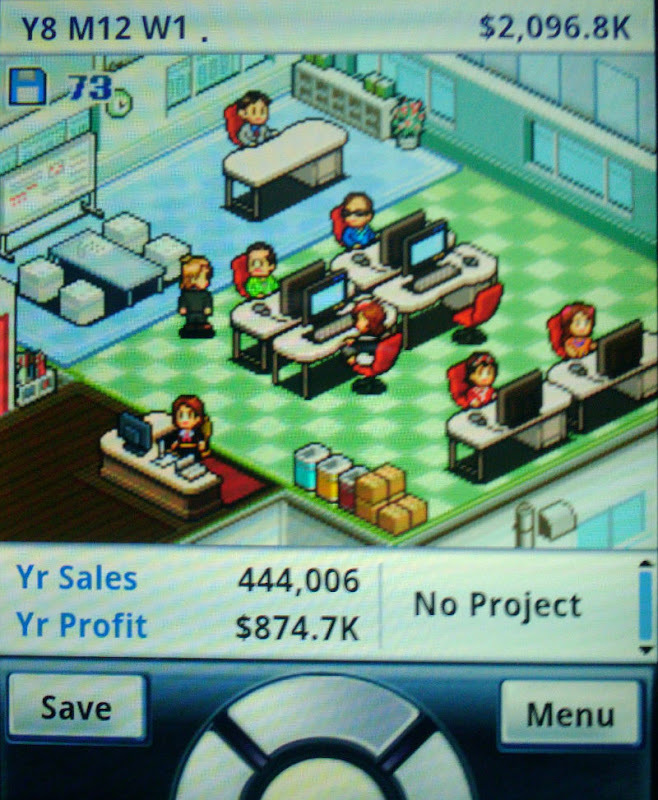 You heard about Kairosoft, right? No? Okay, I didn't know them either before I bought their Android-app "Game Dev Story". It's a Japanese software developer and they offering the game in English. The game sounds simple: You are a software developing studio, more precisely you are the boss of a software startup. You need to produce games that appeals to people, and make selling it. You'll have to deal with a lot of problems. You need licenses for consoles or PC and staff members like artists, coders, sound engineers etc. You can come up with deals to fill up your bank-account. These "jobs" you're doing for other studios. That will help, but doesn't give you any fame. And fame is needed to sell more games yourself. Now if this wouldn't be enough, there appearing new consoles from time to time, like in reality, and old consoles disappear and you won't develop for those anymore. So you'll have to keep an eye on how the new consoles are doing. Licenses are expensive. If you bet on the wrong horse, you will have big losses. If you take the right ones, it brings you a lot of possible customers. After playing a while, you get more genres, like action, simulations, and the overall topic which can be even dating-games :). To do a good game you have to choose the right kind of game with the best topic that are both famous at the market right now. For example if "dating-games" are popular "A" grade, you might choose simulation. A dating-puzzle might not be a real good combination, but you can try however. All genres and topics cost differently. So you also need to care about your finances at anytime. After developing you need to advertise and publish it. You can publish your game even with bugs if you're in a hurry (yeah we know that...). Then you get rated by professional reviewers(booo) and the selling starts. See your game flying off the shelves or cry in agony. There are so many things that comes into the game like a bigger studio with more developers, boosting items to squeeze the most out of your staff, even game-conventions you can appear with booth-babes (which gonna cost ya), and software-awards. It's all in a kind of retro-style, which graphics that instantly reminds you on a good C64-game. The consoles and devices which will get released are also connected to some real devices :) It's amazing and a big fun. And that's only for a few bucks. At the moment I write this it's having a special offer and costs only about $2.52! This game is worth much, much more and guarantees many hours of great fun. Still not convinced? There is a free version which will let you play 2 years of game developing. But you miss the best things, because they come in later. So it's just a little overlook. * Cool idea, reminds instantly on C64-games.